Amount of fragrance cannot exceed IFRA guidelines (listed for each fragrance on this website) and should not exceed this products “Maximum Fragrance Load”. If your lotion does not remain white when you rub it into your skin then you have used too much color. If product significantly thins you have used too much fragrance. You Save $12.85 by purchasing this kit rather than buying the items separately. Goat Milk & Honey Lotion, Luxury Hand and Body Cream, Shea Butter & Aloe Lotion: On low heat, warm base to 120º F or until it becomes liquid. Add cosmetic grade fragrance and FDA approved color additive. Pour into container. Allow to return to room temperature and apply top. Label per FDA label requirements. 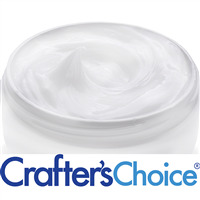 Silky Body Butter: Add approved skin-safe fragrance and color, if desired. Blend thoroughly and place into jars. Label per FDA label requirements. "Great way to make a decision." COMMENTS: Worth every penny. I never thought I wouod enjoy these but I will order more asap. Incredible product! "Great way to find what you like"
"Great Value - Sampler Set"
COMMENTS: I bought the Thick Lotions Sample Set to try out the various types of lotions available. The sampler set is a great value. I got pretty good feedback on all of the lotions, but personally preferred the Shea Butter & Aloe Lotion and the Goat Milk & Honey Lotion. COMMENTS: This is a good way to test out your market for lotions without having to spend a lot of money on one product. I usually make my own lotions but these are really good and come unscented. COMMENTS: A full 1lb of each for an amazing price! Great way to sample them all! Now my problem is they are all amazing!!! Hard to decide on 1 lol. The goats milk I think may be my favorite and of course the silky body butter! The silky body butter makes the perfect whipped body butter! They are all so good and feel great! As always awesome product from wsp! • Awesome way to sample! COMMENTS: An inexpensive way to sample the lotions. You get a full lb of each so there is plenty of each one to experiment with before you decide which one is for you. "Hi! Will the thick lotion work well in a small round tin container, (size: .5) or are jars the only recommendation to hold this product? Thanks." Staff Answer We would not recommend placing a lotion in a tin as the lotion is water based and will rust the tin.